To begin accepting payments using Wild Apricot Payments, you need a Wild Apricot Payments account with AffiniPay (or a regular AffiniPay account). If you want to accept payments using American Express, you also need to set up an AMEX merchant account. For more information, call American Express at 1-877-255-4334. AffiniPay sends you a PDF from First Data (AffiniPay's banking partner in Canada) prefilled with the information you provided on the application form. You print the PDF, enter banking information, and other confidential information, then sign the completed form. You scan the completed forms, along with other supporting documents, then email them to AffiniPay. 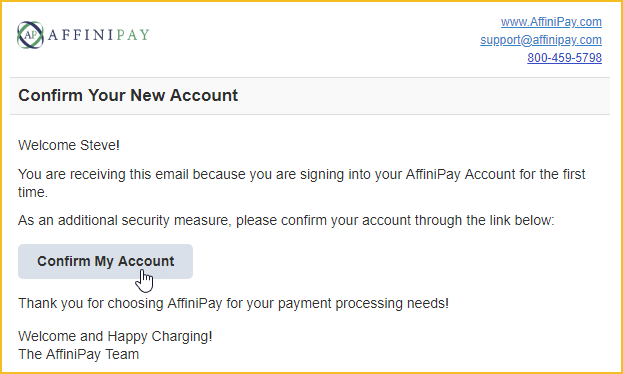 You receive a notification from AffiniPay once your account has been approved. After you receive approval from AffiniPay, you can confirm your account and connect it to your Wild Apricot site. These steps are described in detail below. Go to the Payment settings screen by clicking Finances under the Settings menu then clicking Payment settings. From the Payment settings screen, click the Fill in application button. If you're not seeing this button, but you do see a Learn more button at the top of the Payment settings screen, click the Learn more button then click the Fill in application form button. After you completed the application form, click the Submit application form at the bottom of the screen. Within 1-2 business days, you should receive an email from First Data with a PDF file attached that you need to print and complete. Have the principal sign the application in the Merchant Signatures area. Scan the completed form pages. Scan the principal's photo ID. Scan a void cheque for the business or organization. Email the scanned application forms and supporting documents to wasupport@affinipay.com. Once your Wild Apricot Payments account is approved, you'll receive a confirmation email from AffiniPay. 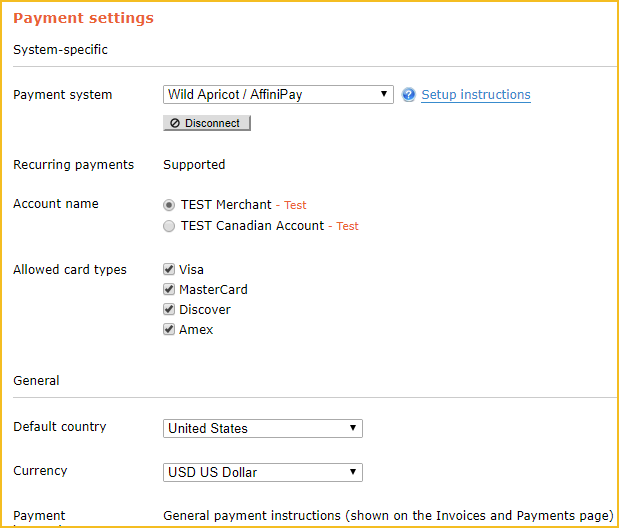 After you receive the email from AffiniPay, you can confirm your Wild Apricot Payments account and connect it to your Wild Apricot site. Within the AffiiPay confirmation instructions email, click the Confirm My Account button. On the screen that appears, choose a password then click Finish. Return to the Payment settings screen by clicking the link within your Wild Apricot confirmation email (US applicants only), or by clicking Finances under the Settings menu then clicking Payment settings. From the Payment settings screen, click the Connect to account button. On the AffiniPay screen that appears, log into your Wild Apricot Payments account using the email address you entered when you applied for the account, and the password you chose in Step 2 (above). You'll be returned to the Payment settings screen, where you can adjust various payment settings. For details, see Payment settings (below). Click the Save changes button to save your changes. You should now be able to accept online payments using your Wild Apricot Payments account.